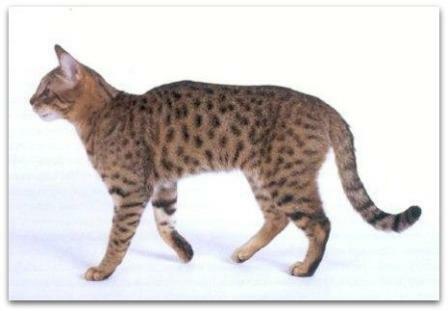 The California Spangled cat was bred to mimic spotted wild cats like the wild African Leopard and Ocelot. This domestic cat was created using various recognized cat breeds. Asian street cats were crossed with British and American Shorthairs, Abyssinian cats, Egyptian Mau and Siamese cats. The California Spangled history is interesting and tragic in a way and explains why this remains an exceptionally rare cat breed. The California Spangled is a spotted tabby. The spots can be square, oval, round or triangular, but more importantly, the spots must be separate and well defined. The pattern is similar to that of the classic tabby. The spots on this cat cover the back and sides of the body, whilst stripes are seen on the throat, legs and tail. This domestic cat comes in a number of coat colors - Black, Brown, Blue, Bronze, Charcoal, Gold, Red, Silver and White. The coat is described as short, but the fur on the tail and underside of the cat (the belly) can be longer. It is a powerful cat with a moderately long, lean, low slung body. It has well developed muscles, a strong bone structure and solidly built thighs. The legs are strong and relatively long. Its hind legs form a 90 ° angle, which makes it appear that the cat is sitting back on its legs and lowering the body to the ground. Its moderately long tail is thick, well clad with fur and adorned with dark fur rings and the tip of its tail is dark and blunt. The California Spangled cat has a rounded head which is medium in length and width and sculptured. The domed and rounded forehead is complemented by prominent cheek bones, strong chin and jaw and a full, well developed muzzle. The whisker pads are pronounced. Its almond-shaped eyes are set wide apart at a slight slant. They are well opened and the eye-color is appropriate to their coat color i.e. gold to brown. The Spangled's ears are large, round tipped and set high on the head. They are playful and active cats who would probably prefer space. Owners need to create an enclosed, escape-proof garden - space for the cat to exercise and explore. They are equally at home indoors, but do remember that a bored cat can become destructive so you will need to provide them with an adventure zone filled with cat furniture, cat gyms and toys. Yes, they love the company of children, provided that younger children are taught that cats need to be treated gently and generally do not appreciate rough play. This is a frequently asked question. Cats and dogs will generally get along provided that they are introduced gradually and that the resident cat or dog's status is respected. If all the cats are neutered, they do tend to get along better. The California Spangled cat is an energetic cat, extremely active, lively and playful. They have excellent hunting skills. These cats are curious and intelligent and devoted to their owners. You will be pleased to know that they are also affectionate and gentle and even tempered. Whilst they look wild, they have absolutely no 'wild blood' in them! They are not aggressive cats. They have short coats which require minimal grooming. A weekly brush is all that's needed. For comprehensive cat grooming tips do visit our cat care pages. The California Spangled cat is a healthy cat breed, but they can contract the common feline diseases, so they do need to receive their annual vaccinations and regular de-worming and dental care. They can be fed dry, semi-moist, raw, canned food or a combination of the aforementioned. A well balanced diet and fresh water is essential. Your cat deserves the best cat food you can afford.